Today, Monday, November 5, 2012 I received word via an email from the office of lawyer Douglas Christie that a formal Indictment has been sworn against me. The following is what is contained in the pdf file which I'm typing out for your benefit. The actual pdf document is contained at the bottom of this email. This is the information of Marina Onciul, a Court Liaison Officer (the "Informant") of Quesnel, British Columbia. Roy Arthur TOPHAM, on or about the 4th day of May, 2012, at or near Quesnel, in the Province of British Columbia, did store firearms, in a manner contrary to the regulations under Storage, Display, Transportation and Handling of Firearms by Individual Regulations made under paragraph 117(h) of the Firearms Act, contrary to Section 86(2) of the Criminal Code. THE INFORMATION SWORN ON NOVEMBER 5, 2012 CONTAINS A TOTAL OF 2 COUNTS ON 1 PAGE. I am including the actual pdf document containing the above information as well as a letter from Crown Council sent to Doug Christie. I would ask that you hang on to this as I could in fact be arrested tomorrow and prohibited from posting any more information on the net or sending emails as was the case for the past 5 months. Now that I've been charged the case will go to court and I plan to have it held here in my local community of Quesnel before a Judge and a Jury of my peers. I would also ask of you that you hang on to the website url to the following blog which contains my PayPal account. I will most likely need this to help in soliciting for donations to pay legal costs. The url is http://www.quesnelc ariboosentinel. com and the PayPal button is on the top right hand corner of the home page. Please, if you care to donate don't send any cheques or money orders in care of "Radical Press". Judging from the wording of this Indictment it looks like it's going to be a battle between the Christians and the Jews. As the graphic at the top of this post indicates it is B'nai Brith Canada who is sponsoring this attack against me and my website. Please bear that in mind always. The two people who laid the complaint against me are Richard Warman and Harry Abrams. Both of them are working for B'nai Brith Canada (although Warman would deny this). I would ask of all my fellow Christians that you keep me and my family and Douglas Christie in your thoughts and prayers as we proceed into this crucial battle for freedom of speech here in Canada. Please pass this on to your friends and associates. The police took all of my email contacts back in May and I've lost 90% of the addresses I used to have. Thank you. If ever there were bogus charges for the sole purpose of character assassination and the making of political hay, it is these. The fact that Arthur uses the words Jewish and Zionist interchangeably is consistent with what the Harper regime does too, equating one with the other. If one is complicit in genocide, the the other must be too. Ergo useless charge. Harpy's always saying that we cannot ask of israel what we won't for other countries. Well, this is the forum to make those demands. The charge on irregular storage and transport of a firearm is a non-issue. No criminal intent can be proven, and a $fine should be issued. Case closed. It's not like he had a loaded Uzi on the passenger seat, or pointed at some child's head in the street. Oops! That's right, only Jewish soldiers do that! Canada WAKE T.F. UP! If the Harper regime can come after Arthur, they can come after YOU!!! It doesn't matter what he says, it's his right to say it. it IS your business! Your DUTY is to defend Arthur's right, and by default, your own too. Our cheque is being written and will be en route before sundown. Now that they've come for Arthur....who will speak out for him? Thank you, Marty and Kate, for your support of this brave and honest man! The equating of Jew = Zionist has been a deliberate policy of confusion so that the hoi polloi would figure that when speaking against Zionism one could be accused of religious persecution or slander. This idiocy is now law in most countries run by the Jews. Criticize Israel and you are criticizing all Jews.... outrageous but a clever ploy we all now work so hard to expose. As for the weapons charge.... the man lives way way way far back in the bush where having a weapon can be a matter of life or death... bears, cougar, wolves, etc. Just a foolish tag-on to hopefully make him come across as a mad gun-wielding supremacist perhaps? 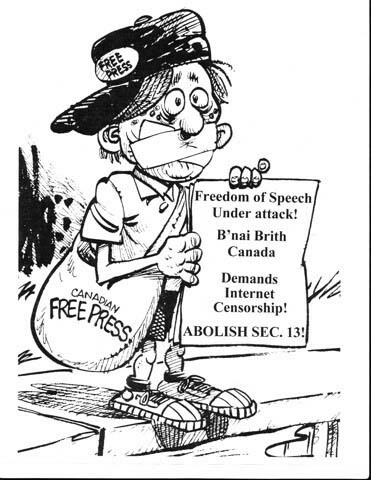 Check out the Radical Press, his blog, link to the right under Canada Radical Press to see the wonderful work Arthur has done in the past and you will see why this brilliant gentle man is a target. Warman and Abrams have been trying to bring Arthur down for 15 to 20 years now.